Onto Aerial Geomorph #3, although a similar flight along the MRV in the future will result in an Aerial Geology post - there is some very interesting geology within the valley (very old rocks). 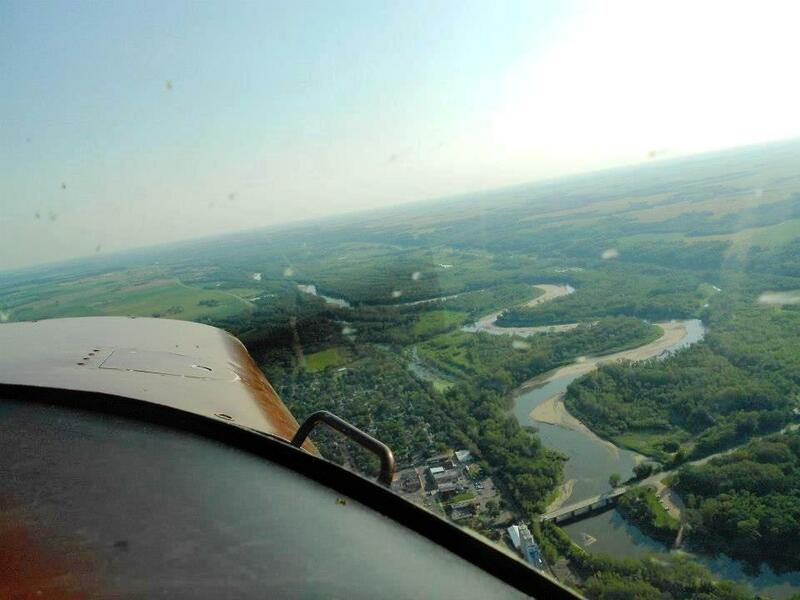 This flight's purpose was to check out the Minnesota River and Minnesota River Valley just southwest of the Twin Cities. Like the Mississippi River, this river has an interesting glacial and geomorphic history. Also, this is one of those specific topics early on in my geology education that got me hooked. Although this flight was to explore the Minnesota River, it was really a story of Glacial River Warren. The Minnesota River is an under fit stream, which means it occupies a valley that is too large for it. 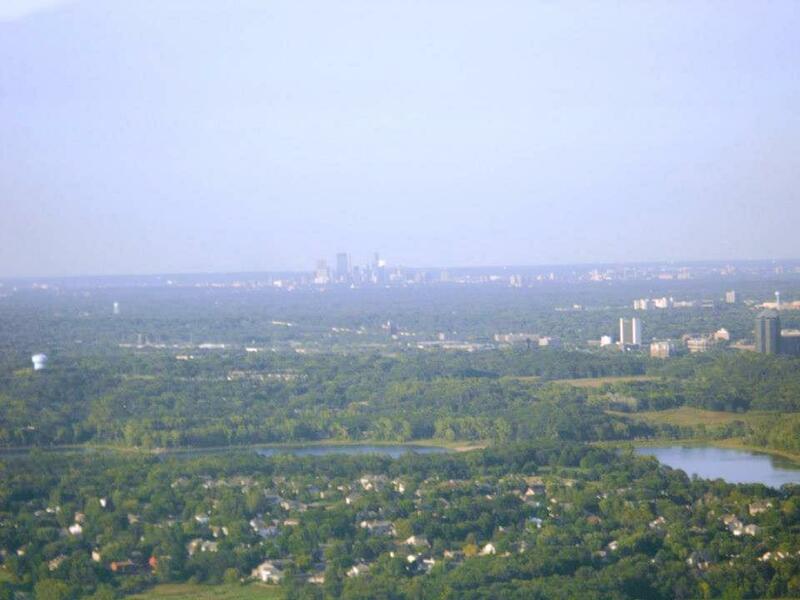 The Minnesota River Valley was carved out previously by the much-larger Glacial River Warren. A nice explanation with figures can be found here, but to summarize, the glacial river was fed by the draining of Glacial Lake Agassiz at the end of the most recent glaciation (just about 10,000 years ago). This enormous discharge of water removed a lot of overlying sediment and rock and in some parts of the valley some very old rocks are exposed (see Morton Gneiss, Montevideo Gneiss, Sioux Quartzite, and so on). A friend of mine came along since she'd never been in a small plane before. Most of the following pictures are courtesy of her. 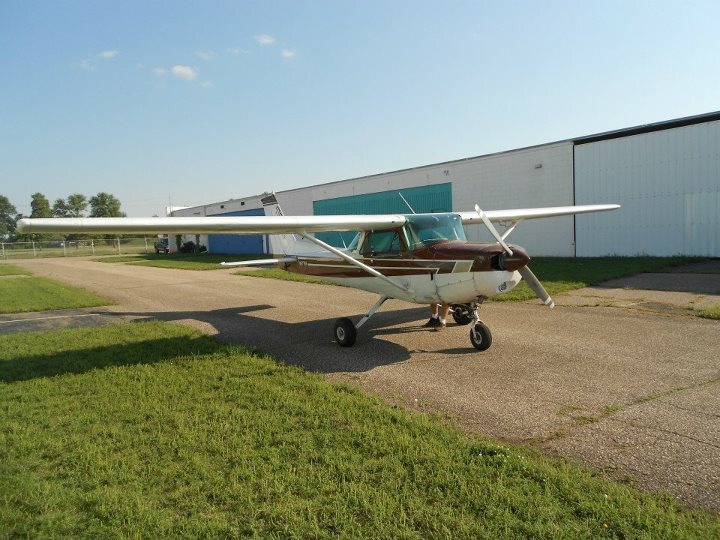 We took off from Flying Cloud Airport in the trusty Cessna 152, flew southwest along the Minnesota River, stopped quickly at Le Seuer Airport, then flew back to Flying Cloud. Flight path (red line) for MRV Flight #1, starts at Flying Cloud Airport (KFCM), southwest along the Minnesota River to Le Sueur Airport (12Y), then back to Flying Cloud. Flight path (red line) along the valley between where it turns northward and the Twin Cities. 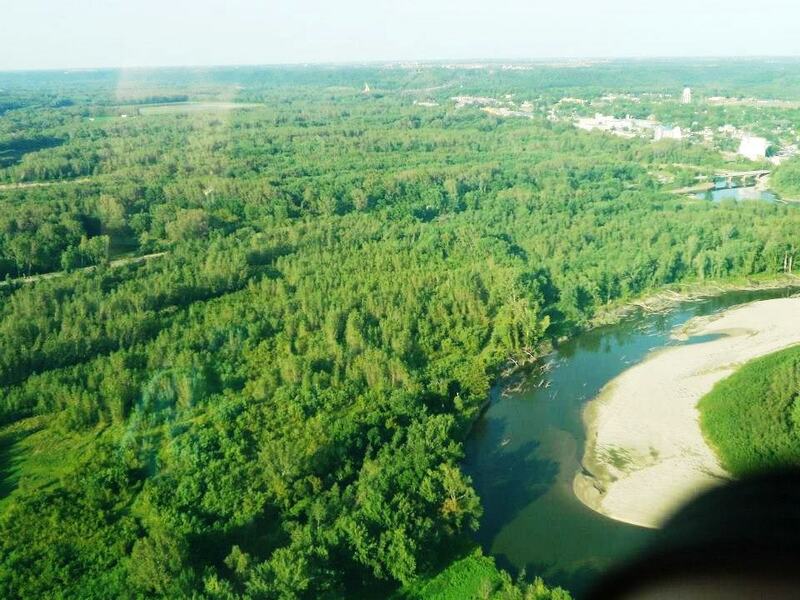 The first glimpse into the size of this huge former river became apparent near the city of Jordan, Minnesota. Northwest aerial view of Jordan, Minnesota, with US Highway 169 on the bottom left, and Minnesota River on the other side of the city. 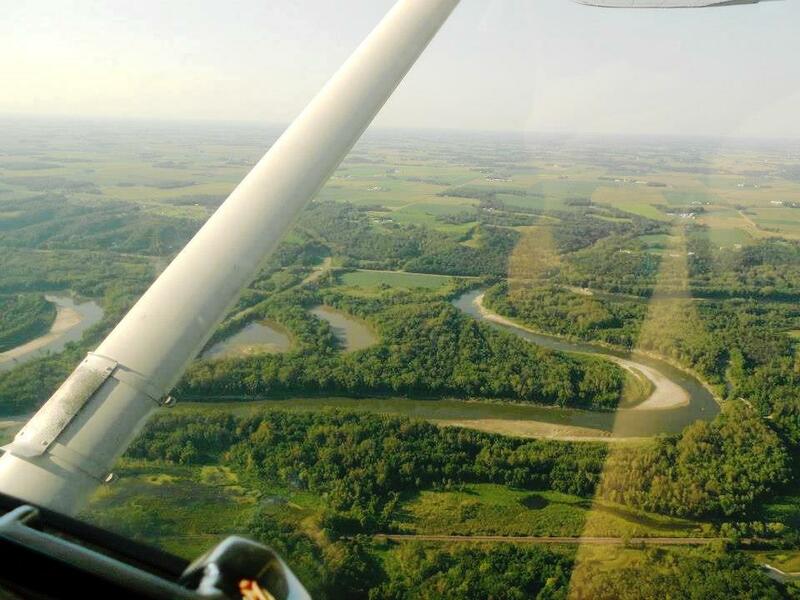 Aerial view of a textbook version of an oxbow lake in the Minnesota River, upstream from Jordan. A gravel pit is in the background, just on the other side of the oxbow. Although it wasn't clearly apparent, using Google Earth allowed for a great way to illustrate how the Minnesota River compares to the current valley, and a look into how both rivers have affected the building of cities and roads. Below is a cross-section made using Google Earth (and some stratigraphic information) across the above photograph of Jordan. Geologic cross-section near Jordan, Minnesota. The Minnesota River Valley near Jordan is about 3 miles across. The city of Jordan and US Highway 169 are built upon a fluvial terrace (former flood plains which are now above the current flood plain). These terraces, while providing convenient flat ground to construct roads and cities, are also remnants from glacial activity causing stream rejuvination. The Jordan Sandstone outcrops near Jordan, named so after the city (rock formations are typically named after the location which they were best described, called a type locality). The current Minnesota River is very small in relation to the valley it occupies. The Glacial River Warren occupied the entire valley during its existence. The glacial sediment thickens toward the northwest, while the stream itself is at nearly bedrock-level. Numerous gravel pits occupy the highland on the north side of the river, mining aggregates (sand and gravel) deposited from glacial activity. Needless to say, it is one of Minnesota's main natural resources. In 1997, over $180,000,000 worth of aggregate was mined in Minnesota (MnDOT). Upstream from here provided another good view of the Valley near Henderson, Minnesota. This was a good spot to really visualize the size of River Warren. Northwest aerial view up the Minnesota River Valley near Henderson, Minnesota (left edge of photograph). The Minnesota River flows from bottom left to upper right, turning around a bend and going northeast. The valley is distinguished by the tree cover, and the highlands are cropland or fields. Cross-section across the Minnesota River Valley by Henderson, Minnesota (see photo above). The valley is about 3 miles wide at this point. Henderson appears to be built upon a small terrace, with another smaller terrace uphill from it. Cross-section of Minnesota River Valley near Henderson, Minnesota, showing the size of Glacial River Warren (defined by the width of the valley) to the current Minnesota River. Masterful artistic rendering of what the Glacial River Warren may have looked like to Early Holocene pilots flying around Henderson, Minnesota. The above illustration is what I had envisioned in my mind during the flight. Parts of the Amazon River get this wide. Content I had seen what I wanted to see, we proceeded to return back home. 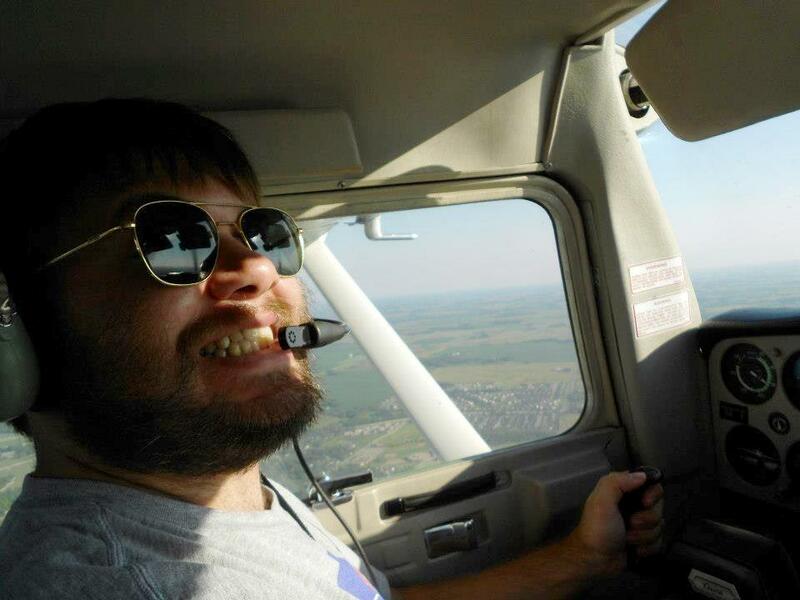 Since it was such a nice day for flying, we took plenty of additional pictures. 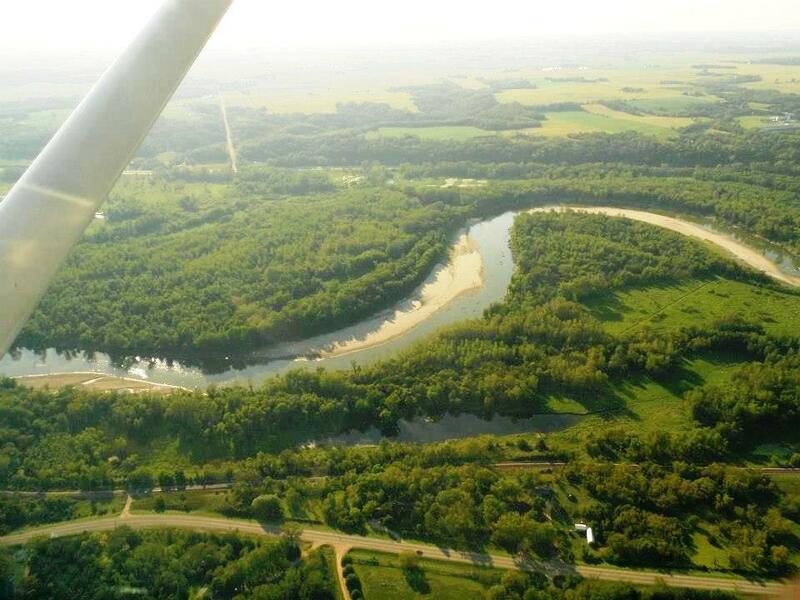 Aerial view of Le Sueur, Minnesota, along the Minnesota River. 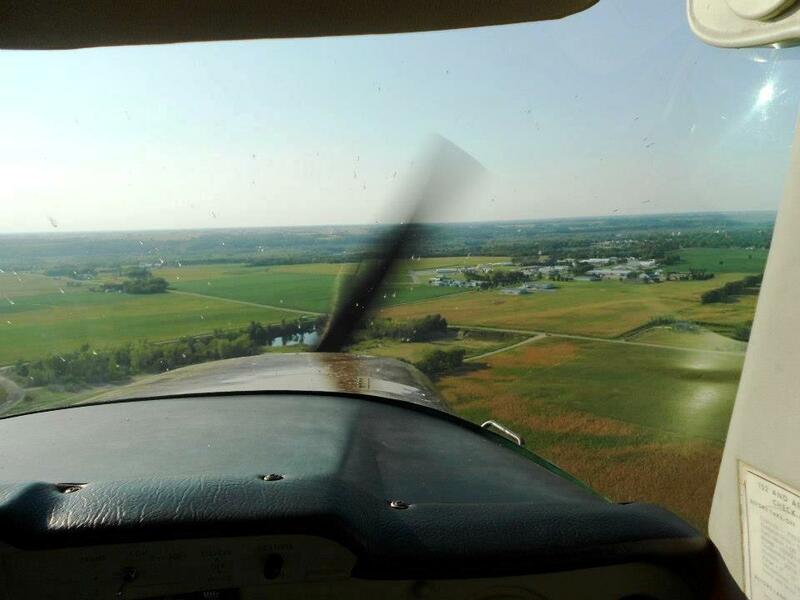 Landing at Le Sueur Airport. 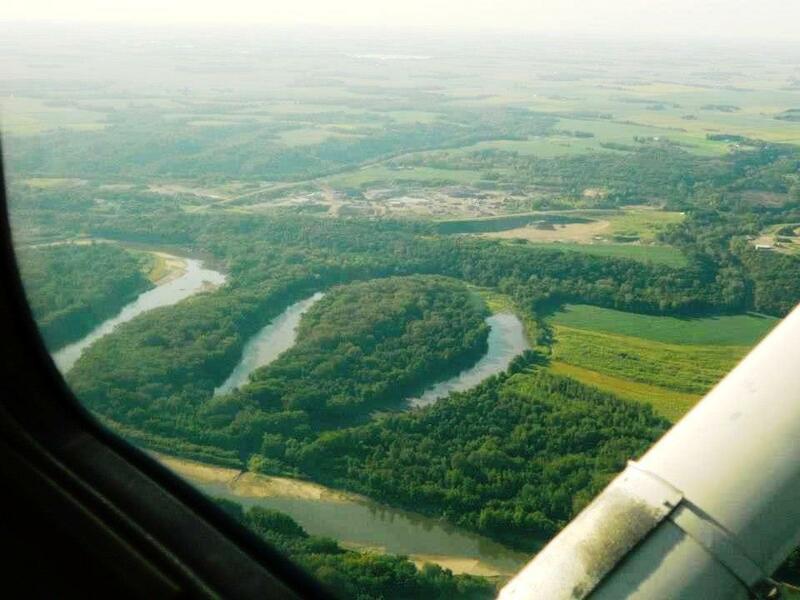 Aerial view of meanders, meander cut-offs, and point-bars along the Minnesota River. From the air is a good place to see and learn fluvial geomorphology. Aerial view of the Minnesota River. Even though you learn about point bars forming on the insides of river bends, I'm still amazed that the textbooks are right. 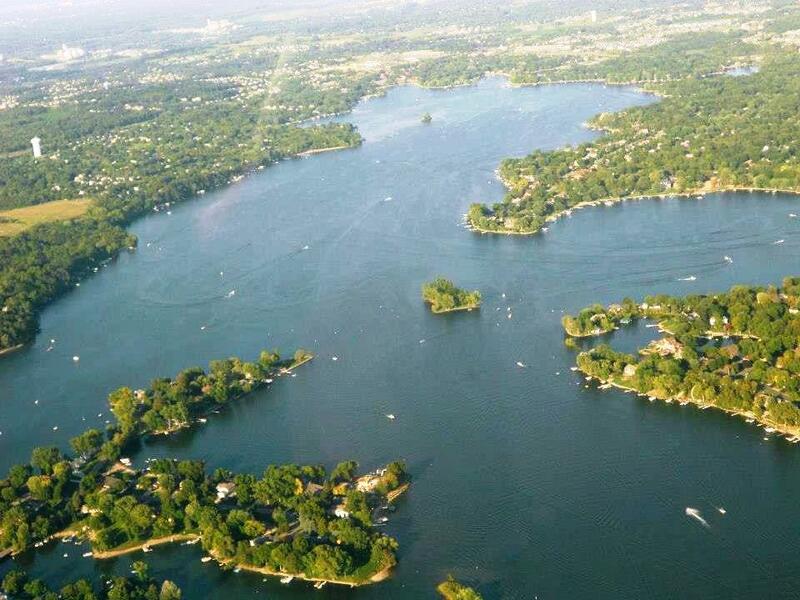 Prior Lake, a good geographic marker to contact air traffic control. Good day for some aerial geology! And I got brownies! A valuable and informative detail about the drone and it's all your detail are very informative.